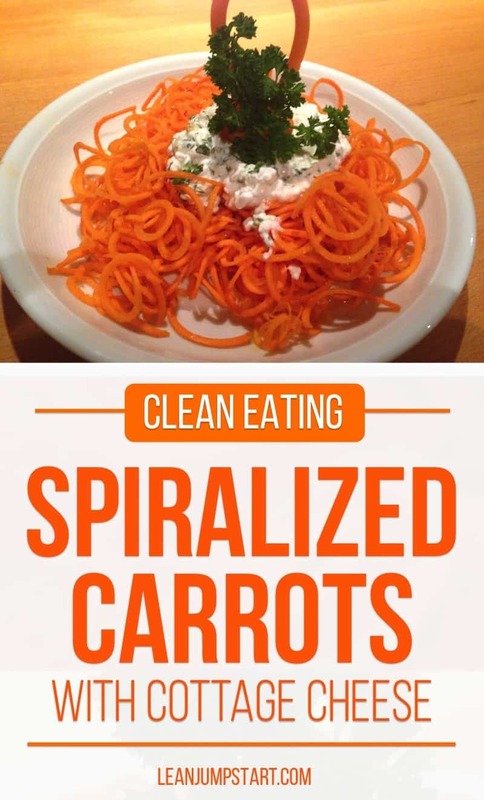 Clean eating spiralized carrots with cottage cheese is a snack my 14-year old daughter surprised me some weeks ago. After I finally bought her highly praised Lurch Spiralizer she wished for a long time, she wanted to prove that this new kitchen gadget is worth its money. When the postman rang and brought the Amazon package I allowed her to open it and take a look at it. In the meantime, I went back to work on my computer. Half an hour later she entered my office and said that a little snack is waiting for me in the kitchen. 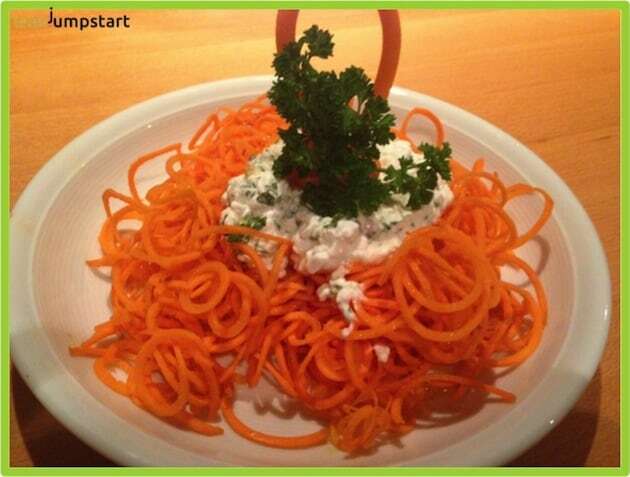 She really impressed me with this colorful spiralized carrots with cottage cheese. It is a nutrient-dense snack where you get protein from the cottage cheese and complex carbohydrates from the carrots. Such a snack has the potential to keep you satiated for a long time. The fiber in carrots is a very favorably composed combination of soluble and insoluble fibers. Even people who are normally sensitive to fiber do not usually react to carrots. While soluble fiber stimulates the metabolism and can help lower blood fats and eliminate cholesterol, insoluble fiber stimulates bowel function and alleviates gastrointestinal problems. Carrots, therefore, have the great advantage that they can do wonders for both constipation and diarrhea. Wow, this was so easy! After we enjoyed a delicious and refreshing afternoon snack I decided to take a closer look at the Spiral Cutting Machine too. How could she create such a wonderful dish in such a short time? She handed me a carrot and I tested it for myself. On the other hand, if you want a roughly similar “pasta” look you would need to use a potato grater. This would not only take you longer but you can then create only broad “vegetable stripes”. I was also immediately convinced that this spiralizer has a high educational benefit. It is a tool that brings creativity into the clean eating kitchen and it can inspire a whole family to eat more vegetables. What is more… it is a lot of fun and can motivate even kids or teenagers to prepare healthy meals. At the same time I realized how sharp the cutting blades were… I was very thankful that nothing happened in the time she used the spiralizer without my supervision. So just in case you are thinking of buying a spiralizer too, please never let your kids use it on their own! I was so impressed about this cutting tool that I dedicated my first product review on leanjumpstart to the Lurch Spiralizer. Click here to read my full Lurch Spiralizer Review!